Wrapped up during a very winding night above 9k feet in the San Jacinto Wilderness. Lightweight – At under 7.5oz with the ‘full hood’ option, the Ptarmigan offers an ultralight solution for those looking for minor splash protection, wind/bug protection, or a little added warmth to a sleep system. Durable – Recently, TiGoat started using a a thicker bathtub floor, adding a lot more durability. The one we tested had the old floor, which was lighter, but less durable, though it has over 700 miles on it and is still flawless. Versatile multi-use Item – Fantastic wind protection and for adding additional 5 to 10 degrees of warmth to a sleep system. 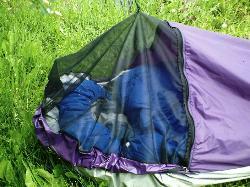 One tester ditched his quilt on a few hot nights and just slept in the bivy (to keep the scorpions away). Good protection against light spray and splashing from rain when using ultralight tarps. “Full Net Hood” option gives you full nylon coverage when you want it, and the just a bug net when you don’t. Or, no hood! Not very breathable – Condensation was a big factor when using this bag on any night with even a little moisture in the air. Though it was never debilitating, most mornings showed considerable condensation within the bivy, on the fabric of the sleeping bag. 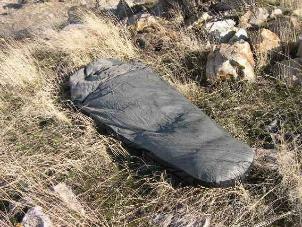 Not waterproof – This bivy is not waterproof at all and should only be used under a tarp if it is raining. There is a level of water resistance, but only so much as, say, a wind jacket. 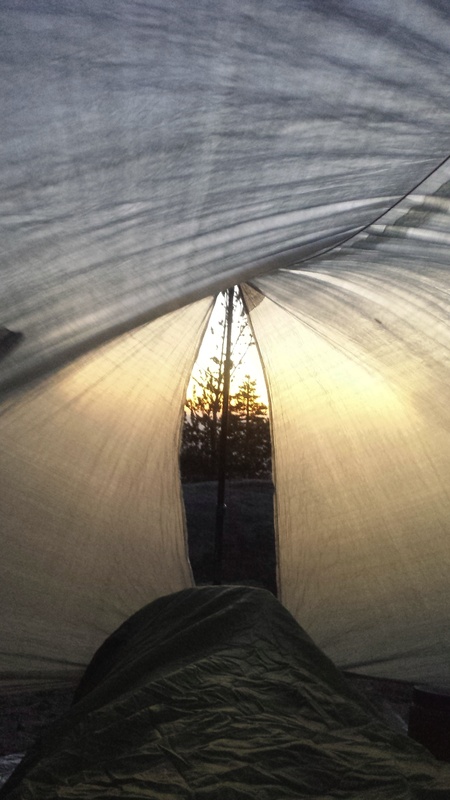 Awkward Entrance – The entrance into this bivy is like that of a top loading backpack. This bivy would be much easier to climb into with a full length zipper. 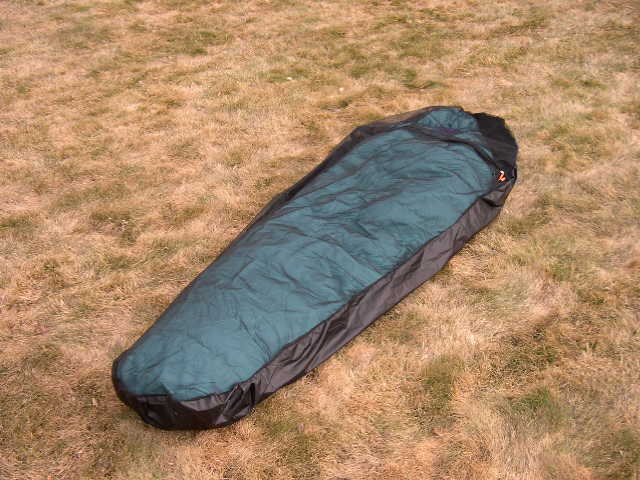 Best Used For: Ultralight backpacking, non waterproof bivy sack under tarp. One tester found comfort in the Ptarmigan when getting blasted with the warm, stinging Santa Ana winds in southern California. On the same trip, balmier nights were spent in just the bivy, as his 20 degree quilt was too hot. I am not a very experienced bivy user, so I am not sure the level of condensation occurred when using a variety of materials and styles (but I will!). That being said, condensation was a big factor when using this bivy, even during, drier west coast nights. A few cold desert nights were stayed off with the added warmth of the bivy, which added a wind break, and a hood for those who use hoodless bags/quilts. I was able to use the bivy with a 20 degree down quilt, but my size 15 feet were slightly cramped in the foot box.